Are you looking for more structure in the daily activities? Download this free personal weekly schedule excel template now! For those who make the biggest impacts, have, what we call, a "high-performance mindset” and are often using professional excel templates to achieve their goals faster, this is the right template. If you are looking for a structured excel template to manage your daily activities per week, this personal weekly schedule template is just what you are looking for! For example your personal and professional activities are often planned on the same time, this planner can help you prevent this in the future. 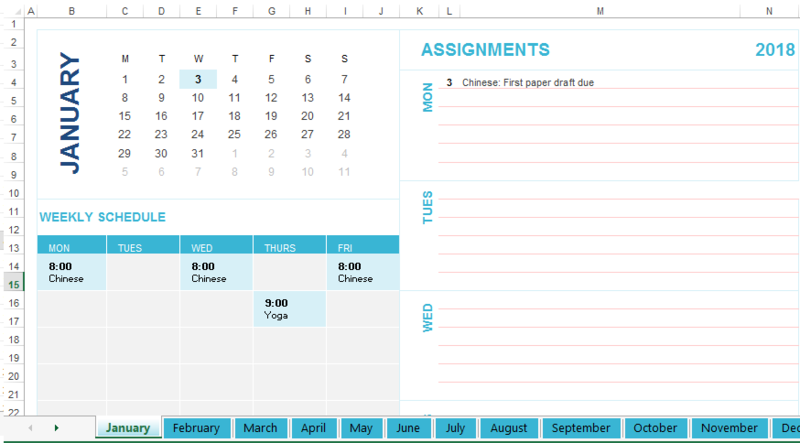 Easy to fill in excel template, so you are on time for your Chinese course or Yoga course! Try out our online Premium and Free planning templates, forms, and contracts today. Save, fill-In the blanks, print …and done!